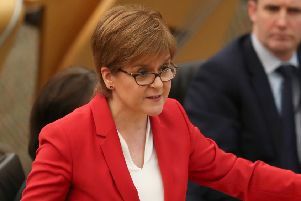 Nicola Sturgeon has defended controversial plans to hand headteachers sweeping new controls over decision-making in schools, insisting it will drive up classroom standards in Scotland. The First Minister told MSPs that plans for an overhaul of the education system, which include the creation of new “education regions”, will not see local councils being sidelined. Make no mistake this is Scotland going down the academies route. But council bosses have now voiced concerns that Scotland could be adopting an English-style academy approach if heads can hire and fire staff. The SNP leader said that ministers “work closely” with councils as she appeared before Holyrood’s convenors, committee. “Right now we have a system where councils very much sit at the centre, they have statutory responsibility and they will continue to be key players,” she said. The governance review of Scottish education, driving much of the changes, was unveiled by John Swinney in September and includes the creation of “education regions” aimed at fostering greater collaboration between councils and addressing the “variation” which often occurs across the country. Councils fear they are being stripped of power and a spokesman for local government body Cosla yesterday voiced concern over Ms Sturgeon’s approach. He said: “Mr Swinney has promised us throughout our discussions on education governance that he is listening to the experts. That is good because it is not just the local government voice that he will be hearing on the ‘whole child’ approach – but the voices of all those in the education system including the unions and parent groups. “As the recent OECD report showed, Scotland has an excellent record on education. “Therefore some of what has been said today at committee seems a little bit odd and different to the rhetoric used so far.